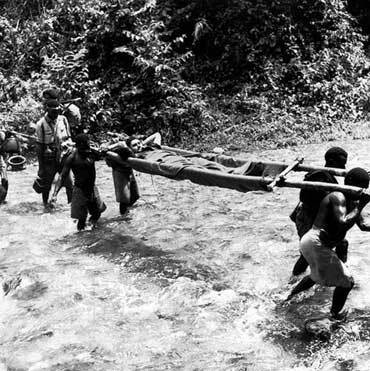 Templeton’s Crossing was in the centre of some of the steepest and highest sections on the Kokoda Track. High on the northern side of the Owen Stanley Ranges the Eora Creek tumbled downwards, cutting an ever deepening gorge which eventually reached the plain below, near Kokoda. The track from Port Moresby crossed the crest in an area known as the Gap, wound its way along the western edge of the gorge, and then plunged to a crossing over the Eora Creek. Across the creek the track was joined by another which had left Myola and crossed the creek further upstream. Lieutenant Kienzle had blazed a new track in early August and it was he who named the point where it joined the old track “Templeton’s Crossing” in memory of Captain Sam Templeton of the 39th Battalion. After leaving Templeton’s Crossing the track moved downwards again towards the village of Eora Creek. During the withdrawal on 2 September 1942, the 2/16th Battalion fought a short defensive engagement in the Templeton’s Crossing area with the Japanese who were trying to overrun the Australian rearguard. 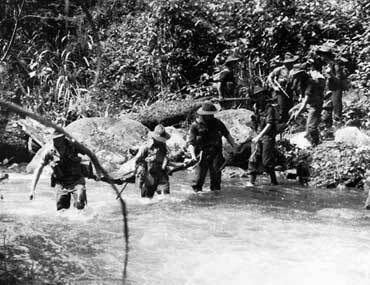 In this wild country with thick jungle, rushing streams, overhanging crests, dripping moss and frequent chilling rain the Japanese established strong positions to delay the Australians during the counter-offensive in October 1942. Following their hard fought battle at Myola Ridge, the 2/33rd Battalion reached Templeton’s Crossing on 16 October and was joined by the 2/25th Battalion which had arrived via the other track after also dealing with enemy rearguard. From here the 3rd Battalion resumed the advance but was soon halted by further strong defensive positions; they mounted an attack, but the enemy were again in depth and the attack faltered, with many casualties, some from shell and mortar fire. On 18 and 19 October, the battalions of the 16th Brigade began to relieve the 25th Brigade and with the 2/2nd Battalion leading the attack also sustained heavy casualties as they had to take each strong point in turn as they struggled up the steep ridge. This engagement was to last almost two days before the track was cleared and the Brigade was able to advance towards Eora village. In an area favouring the defender, the Japanese had delayed the Australian advance for some ten days and while they had taken numerous casualties, they had also inflicted heavy losses on the Australian units. The four battalions of the 25th Brigade had lost 67 killed and 135 wounded as well as more than 500 sick. The 2/2nd Battalion too had lost 20 killed and twice as many wounded.